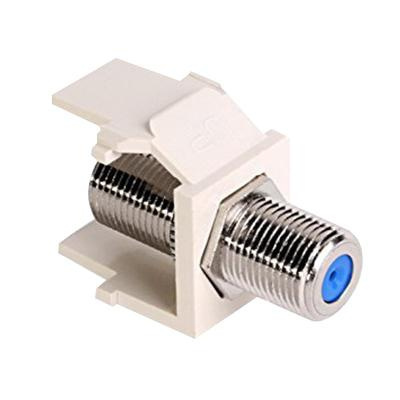 Leviton QuickPort® Feed-through F-connector in light almond color, is suitable for use in all coax applications. Connector with polypropylene insulation, has high-impact fire-retardant plastic body and nickel-plated contact surface. It measures 0.58-Inch x 1.07-Inch x 0.64-Inch. It has frequency rating of 3 GHz DC and impedance of 75-Ohm. Connector has RG-6 RG-59 coaxial cable type. This female-female adapter with screw-on front and rear F plugs connections, features 360-degree gold-plated seizing pin to provide clear signal transmission. Flush and surface mountable connector comes with multimedia outlet system, Decora® inserts, patch panels and patch blocks. F-Connector is UL listed and NEC/FCC certified.